We rolled into southern California yesterday at noon. During these last six weeks, there were many times I would wake up in the morning and have to remind myself what state we were in and whose house we were at. Or, I would leave the bathroom and need to remind myself who I had just been talking to. We had no flat tires. We had no breakdowns. Three cheers for our Honda Odyssey! Gil said, "Can you imagine driving this far in Tanzania with no flat tires?" Impossible. We never got lost. We almost always arrived on time, except when we forgot about time zones. We used a combination of Google Maps and a GPS, and all was well. We named the voice "Betsy." Betsy never let us down. In fact, even though I was a little jealous of Betsy's ability to give directions to my husband in a calm, clear, and concise manner, she is probably the reason that Gil and I are still friends after 9,240 miles. Our kids were amazing. They got into the car when we told them to and got out when we told them to without questioning. They hugged when we told them to hug. They never asked "Are we there yet?" Because they figured out pretty quick that we were never "there." They played with new children and new toys and slept on a new floor almost every single day. They had no schedule, no routine, no consistent bedtime. Yet they kept smiling and playing and Josiah put the seat up in the bathroom almost every time. It helped that they could not touch each other in the car. It helped that they each had their own Kindle Fire. It helped that we had sticker charts and a prize box. We had a great time as a family. As every good TCK knows, home is where your family is. Period. They always smiled; they always hugged us, even if we arrived after midnight, even if they had just moved into their house the day before. We slept in beautifully decorated guestrooms. We slept on air mattresses. We slept on couch beds in the living room. We slept on futons. A couple times people even gave us their own beds, which is a humbling experience. People always said, Help yourself to anything in the kitchen. We were made special desserts. We were taken out for ice cream. We ate grilled chicken and corn on the cob more times than we could count, which was great because we love grilled chicken and corn on the cob, but it did become a kind of standing family joke because we had it so many times. At least 4 families were into whole foods and gave us raw milk and organic apples. Other families brought southern-style BBQ take-out or microwaveable meals. All of it, every bit, was amazing. I loved witnessing different family cultures--on raising kids, on cooking food, on house decoration and cleanliness, on bedtimes and routines and different kinds of fun. There were big houses and small houses, rented houses and owned houses, brick houses and wood houses, city houses and rural houses. I have never experienced so many different types of homes and families and types of family culture in such a short amount of time. Hospitality is not dead in America. Every home was welcoming and warm--every one. It didn't matter whether they had a beautiful guest room or just an air mattress. It didn't matter if they were great cooks or just reheated something. They all were generous; they all gave us their time, their energy, their love.....and it all was wonderful. For most of my adult life, I have been the host. I love being the host. I had a harder time being the guest--the receiver. To be the recipient of so much generosity and grace was very humbling. Do you realize how astounding it is to realize that you have friends all over America? We have said good-bye in our lives more than I care to remember. 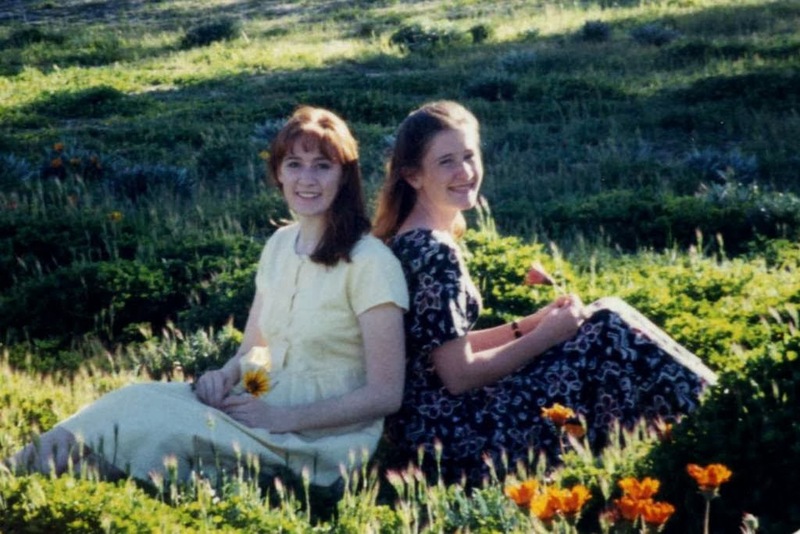 Between being a missionary kid and an adult missionary, my friendships have been transient. I seem to lose them and get new ones every couple of years, and that has often been really, really hard. Now I have friends all over the United States. During these last six weeks, Gil and I often said that we felt like we were debriefing from....our entire lives. We visited friends from pretty much every major season of our lives. We got to reconnect with people and re-live memories that spanned from my childhood onward. It was incredible. Over dinner, around a backyard campfire, in a hot tub under the stars, many times over the din of children jumping, children laughing, we talked. The long, deep, soul-nurturing conversations with history-friends were definitely the highlight of this trip. Thank you, Friends. We are so blessed by you. The Petrified Forest is a forest in a desert....the remains of ancient trees which have now turned to stone. Gil told the kids, The White Witch was here. We visited Laura, Andy, and Aimee (and their families) in Arizona--three siblings from our college days, who also grew up as MK's in a neighboring country to Liberia--so we have lots of mutual friends. and of course....what would be a trip to Arizona without a visit to the Grand Canyon? When I was in sixth grade, I wrote a short story that took place in the Carlsbad Caverns. My mom had told me about them, and I was fascinated. I have wanted to visit them for practically my entire life. How can I possibly describe this place? Like something out of a fantasy novel. Unlike anything I have ever seen. Gil is a great photographer, but these pictures do not do justice to this experience. These caverns are 750 feet below the ground. The magnitude of the rooms under the earth was completely mind-blowing. Such a creative, magnificent God we serve. The formation behind us is called Rock of Ages. We learned that many years ago, when guides got to this place, they would shut off all the lights except the one on this stone. Then everyone would sing "Rock of Ages." In a cavern of that size, what that would sound like? Look like? Someday, on That Day, maybe we'll get the chance. So much scope for the imagination. It gets into your bones and makes you a different person. Phil and Megan were part of the college group we led 10 years ago. Tommy was part of it too. It's been pretty neat to see the fruit of that ministry. Mike and Laura were friends from our church in California. Nathaniel and Wendy were friends from college. Christine and I were also friends from college. We haven't aged a bit, haven't we? We also visited the Cox family in Texas....the one family so far that we forgot to get a picture of. Argh. Two more states to go....we are almost there! Moving into our apartment on Saturday! So I'm getting behind in my blogging.....But here we go....headed west! Steve was the director of HOPAC from 2005-2008 and we loved working under him. Josiah was a Pterodactyl in Georgia. What does this have to do with Georgia? Nothing. 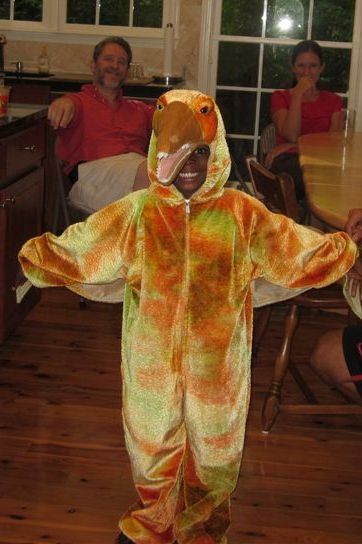 He was just the cutest Pterodactyl ever. In Atlanta, we visited the neighborhood where Martin Luther King Jr. was born, the church he preached in, and the place where he is buried. Amy was a teacher at HOPAC and a leader in our youth group back in 2005-2006. Last year in first grade, Grace did a big report on Helen Keller. So of course, everyone in the car was super excited to find that we were only minutes away from her house. It was a Sunday, so we couldn't go in, but at least we got to see the outside. Despite being in Memphis, we did not see Elvis. However, we did see Josiah and Lindsey. Josiah was one of our college students during the years we led the college group at our church. He is also brother to a number of our other friends! Our kids were very excited about visiting "the house with the 7 kids." The kids told us today that they want seven kids in our family. "Because then you never get lonely." Heather was a teacher at HOPAC a few years ago, and we knew Quincy from college. We got to be a tiny part of their love story in Tanzania. They hosted us in their house that they had just moved into the day before. Now that's hospitality. "Aunt" Heather was pretty special to the kids in Tanzania. We also visited Brian and Ruth, friends from my childhood in Liberia and Ethiopia. I had not seen them in 20 years. Karen and Victoria and their family were wonderful friends for many years in Tanzania. And then there was Christa...who was a part of our lives since she was in 6th grade...and now she is a college sophomore. She baby-sat our kids for years....stayed with us a few times while her parents were traveling....so it's pretty amazing to see her all grown-up and responsible and loving Jesus. I knew that I would find Washington DC fascinating. I had no idea that so many parts of it would so deeply move me. that's about as close as you can get to the White House! We stayed with our friends Chris and Heather in Virginia during the days that we were in DC. Their daughter Lisy and our Lily were fast friends during the three days we were there. Lily cried when we left...Lisy was special. at the Museum of American History--this is the car that made the very first road trip across America. It took him about 3 months....we did it in 2 1/2 weeks. at the Museum of Natural History. This was seriously probably the coolest museum ever. Dinosaur bones, the Hope Diamond, an incredible mineral/gem display...we only got 2 hours there, but could have spent all day. and this starts the emotional part for me. These were the chairs from the Greensboro Sit-In during the Civil Rights Era. We saw the actual 13th Amendment. We saw an original copy of the Emancipation Proclamation. And I knelt there with my African daughter and tried to read it to her, and I choked up. And we gazed on the Memorials of these two great men, who changed America, and are a major reason why I could stand there with my African children and call them my own. and we thought on all the men who gave their lives so that we could have freedom. and at this tomb, in Arlington National Cemetery, we taught our children about respect and reverence and honor for those who sacrificed for what we have in this truly great country. There is much we can complain about in this country. But I have lived in several other countries in my lifetime, and visited many others, and there is no place like America. No other country encourages immigration like she does, who welcomes the poor and the refugee. No other guarantees the freedoms and the opportunities that we have. There is much that is wrong, but there is still much that is right.